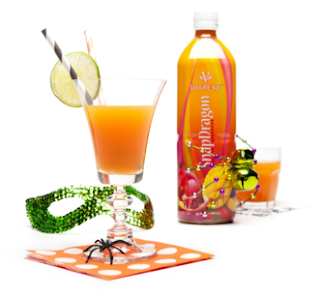 Votre Vu’s Snapdragon Beverage ($26, 2-pack) is a delicious private blend of powerful anti-aging super fruits and botanicals that feature mango, pomegranate, and acai berry juices. It also contains seven daily vitamins, plus collagen, aloe vera, foti, ginkgo biloba, and Baobab Fiber. There are no preservatives or sugars added, but don’t worry, the blend of fruits and botanicals makes this drink naturally sweet! The SnapDragon Beverage plays very well with others such as lemonade, fizzy water, and the 21+ crowd. Plus Halloween is right around the corner and we can’t wait for all the parties that come with! 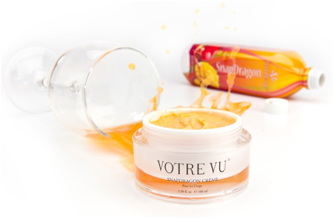 But, while you’re getting all dressed up, don’t forget to moisturize with Votre Vu’s SnapDragon Body Crème ($42) because it is sure to be one chilly Halloween night! Votre Vu’s SnapDragon Body Crème is a luxuriously orange body crème that intoxicates your skin with a freshly squeezed citrus aroma and marine-and-botanical blend that helps firm and guard against aging.